I wish if you could have tasted my mom's spinach turnovers! She always makes dozens and dozens of spinach, meat or cheese pies and stuff them in the freezer. I had the chance to taste all of these great appetizers during my stay in Lebanon, and of course, I had to note down the recipes. Well, I think you will be happy because I came back with lots of delicious recipes!! 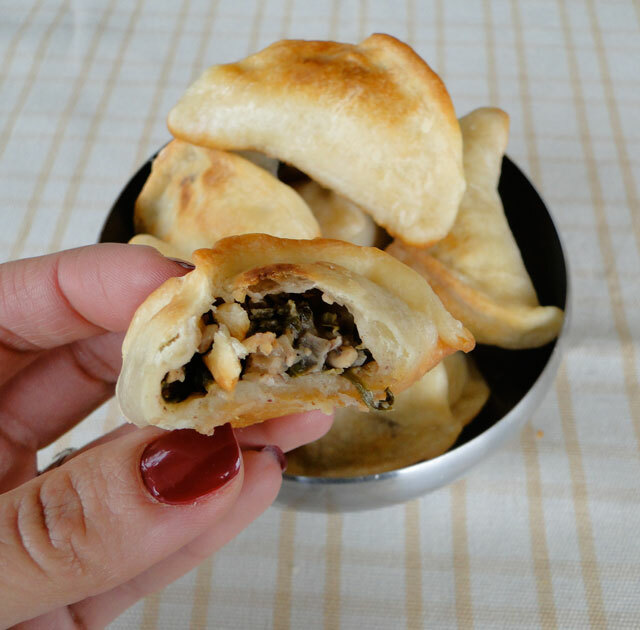 What a treat I have for you today; Lebanese fatayer or Lebnaese spinach pies or turnovers! Mix all the dough ingredients starting with half a cup of water then if needed add more water gradually until you get a smooth dough. Cover and let it rest for about one hour. Chop the spinach then place them in a colander, sprinkle some salt and mix. Then squeeze all the water out. In a bowl, mix the chopped onions with all the spices. Add them to the spinach. In another bowl, mix the oil, lemon juice and the pomegranate molasses. Now, pour the dressing very conservatively until the spinach are moistened but no more than that. If the stuffing is too wet, it will open up the turnovers. When the bread dough has risen, roll out on a floured board to ¼ in (6mm) thickness and cut into 3 in (8 cm) circles. 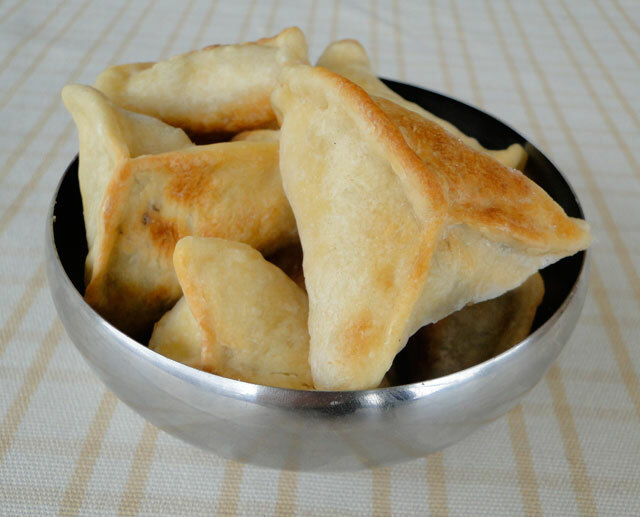 Place a tablespoon of filling on each circle of dough and fold to form a triangle shaped pie. Secure edges together by folding them over and pressing firmly. Place the pies on a greased baking tray and brush each one with oil. Bake in a preheated oven, 400°F (200°C) until lightly golden around 20 mn. Serve hot or cold. Mélangez tous les ingrédients de la pâte en commençant par une demi-tasse (37 ml) d'eau puis, si nécessaire ajoutez de l'eau progressivement jusqu'à obtenir une pâte lisse. Couvrez et laissez reposer pendant environ une heure. Hachez les épinards puis placez-les dans une passoire, saupoudrez un peu de sel et égouttez en pressant fort pour extraire le maximum d'eau. Dans un bol, mélangez les oignons hachés avec les épices. Ajoutez-les aux épinards. Dans un autre bol, mélangez l'huile, le jus de citron et la mélasse de grenade. Maintenant, versez la vinaigrette graduellement jusqu'à ce que les épinards soient à peine humides. Si la farce est trop humide, les chaussons vont s'ouvrir. Quand la pâte est levée, roulez-la sur votre plan de travail fariné d'une épaisseur de 6 mm et coupez-la en cercles de 8 cm. Placez une cuillerée à soupe de farce sur chaque cercle de pâte et repliez pour former un triangle. Soudez les bords en appuyant fermement. Placez les chaussons sur une plaque à pâtisserie huilée et badigeonnez chacun d'huile. Laissez cuire dans un four préchauffé à 200ºC jusqu'à ce qu'il soient légèrement dorés environ 20 mn. Servez chaud ou froid. Wow I wish I could have a couple of these cuties for the dinner! I get therse at the local Mideastern market. I'll have to try making my own. I love that Lebanese speciality! A gorgeous mezze dish. Your turnovers look so pretty! These look incredibly delicious Chicho! I love the photos too! Good job, Chicho! These turnovers look killer. Those spinach turnovers look fabulous. I'm definitely going to be trying this one! Oh wow these turnovers look fabulous! i love spinach too so I'll have to try this. Ils ont l'air délicieux ces petits chaussons!! Your pictures just looks amazing!! I will make these as soon as possible! I wish I could make meat pies or cheese pies for my husband, his grandmother made the best ones. I wish I would have learned. =( Do you know how to make filling for cheese or meat ones? I wonder if these could be made with whole wheat? I bet these are so delicious. The sumac and pomegranate molasses make it sound ver appealing. These look and sound delicious! I SO wish I could taste them rather than just stare at them. Your pies look amazing! I have such a hard time keeping mine closed. Especially when I make meat pie. I guess I've got to practice more! Chicho, I'm sure these are delicious! I can't wait to see what other wonderful recipes you will be creating. Itbeen a while. I love the way these spinach turnovers look. My husband and I have enjoyed the recipe and pictures. Yummy... This my type of food to go with my afternoon tea.. 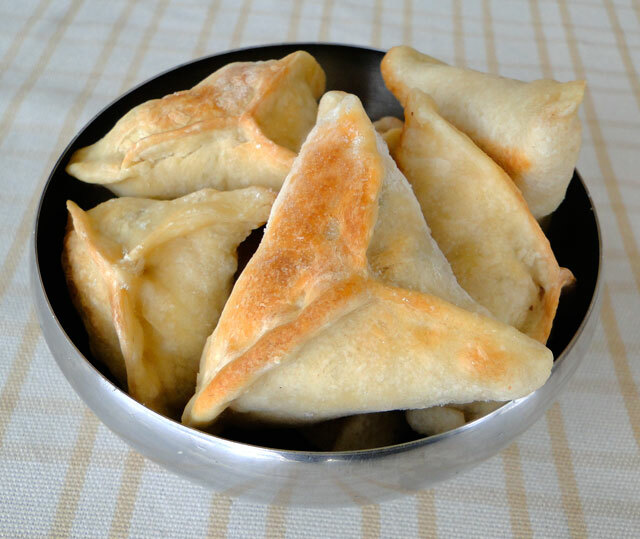 I love the triangle shapes and lovely recipe! Yummy looking and tasting! The best ones I have had in Lebanon were made by a Kurdish cook Asma; I was never able to replicate hers. Love your pics. Makes me want to eat the whole bunch! Iam working on the spinach now, and then the dough. This is exactly what my mom used to make when I was a child. We would always have some and I snack them when I came back from school. These remind me of those happy years. Different from yours, mom used to cook the filling before placing them in dough circles. I must make these perfect snacks soon. You know, I'd love to add pine nuts to this too. Mmm. Good stuff!